Happy Valentine’s Day from Suffrage Centennials! Make “Votes for Women” fortune cookies for a special gift! on Vimeo. Happy Valentine’s Day! Make some “Votes for Women” fortune cookies for your friends and family members for birthday and holiday gifts! Part of the emphasis is that on Valentine’s Day we are reinforcing the news that we are partners with Vision 2020, along with other organizations working to bring attention to the 2020 votes for women centennial nationally. Visit our sister sites, along with QuakerWomen.com, the most recent addition. If the first wave of women’s rights doesn’t include Quaker women, then we will have increased the black hole of misinformation about the movement. Let’s see what Quaker women have to say about filling in the blanks on Valentine’s Day of 2019. Vision 2020 is one of many organizations working hard in public and behind the scenes. Join us! This entry was posted on February 14, 2019, in Blog and tagged Suffrage Wagon Cooking School, Votes for Women. Wyoming celebrates 150 years of women voting! On December 10, 1869, Wyoming territory passed the first law in United States history granting women the right to vote and hold public office – more than 50 years prior to the U.S. ratification of the 19th amendment. The State of Wyoming’s tourism office is focusing on this commemoration. Since SuffrageCentennials.com is a clearing house for events and information, send us news of suffrage centennial events and points of view. If you aren’t planning with your organization for a 2020 observance of the 100 years of American women voting—you should be. What will you do personally, in terms of advocacy, to honor the past 100 years of women voting in the United States? Put this on the top of your “to do” list to think about during 2019. And then on January 1, 2019, make a resolve as to what you plan to do about it. We’re all caught up with end of the year activities. Start thinking now about 2020 during 2019—and then 2023 when women in the US will have been working 100 years for an Equal Rights Amendment in the Constitution. Make an end of the year donation NOW and support your priorities! Enter the conversation. Send us your events and thoughts about planning for 2020. The Minnesota Historical Society is working with its partner, the League of Women Voters, to celebrate 2020. Are you following the campaign to honor Inez Milholland, the U.S. suffrage martyr, from now to 2020? 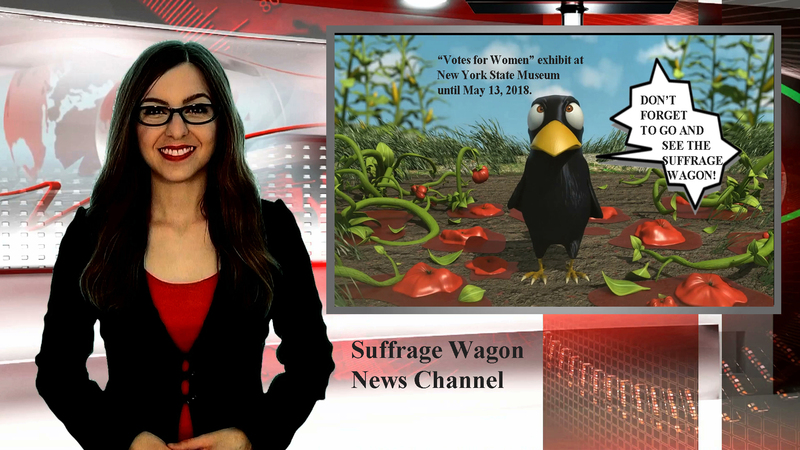 Plan a trip to the New York State Museum that is putting the “Spirit of 1776” suffrage wagon on exhibit during 2020 and part of the rotating permanent exhibit! Support Turning Point Suffragist Memorial in opening its doors in 2020 to celebrate the national suffrage centennial! Don’t forget the fundraising appeal for the restoration of the Farmington, NY Quaker Meeting House that sponsored many historic events. LetsRockTheCradle.com is a public service for writers, editors, educators, bloggers, newsletter editors, and many others who are interested in spreading the word about the 2020 centennial celebration in the United States when women will have been voting for 100 years. This entry was posted on December 12, 2018, in Blog and tagged 2020 suffrage centennial, National Women's History Project, New York State Museum, Turning Point Suffragist Memorial, Votes for Women. 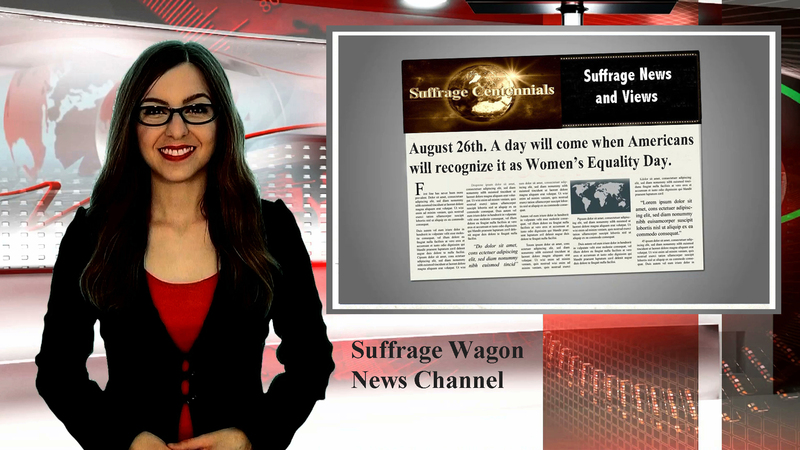 We are on a roll convincing Americans that August 26th, Women’s Equality Day, should be a national holiday. The National Women’s History Project has been testing the water on this. It appears that the idea is beginning to catch hold. It hasn’t happened yet, and no one is predicting any arguments in public. The idea is just starting to register. And swells take quite a while to begin rolling on the ground. This is no fly-by-night idea. Discussions about the importance of August 26th have been kicking around for a while. The U.S. Congress got Women’s Equality Day up and running. The same with March, Women’s History Month, designed in large part, to write women into history—supported and nursed by the Women’s National History Project over the past 40 years. Writing women into history is, by no means, a radical idea. But since women have been an unrecognized resource in our nation, we have to look to the future, and we see a future where August 26th is recognized for what it is—an opportunity to acknowledge and celebrate the accomplishments of millions of Americans. Let’s bring August 26th out into the Light. One web platform has a rallying cry: Lets Rock the Cradle. This entry was posted on September 29, 2018, in Blog and tagged August 26, Votes for Women, Women's Equality Day. Inez Milholland, the U.S. suffrage martyr, honored during 2018 through 2020!! Inez Milholland on Parade during 2020! on Vimeo. Follow Suffrage Centennials on our Facebook page, Twitter, email subscription, and the Quarterly Newsletter. Sign up for email on this web page. Stay up to date with postings, audio podcasts, and videos. Plan for your suffrage centennial event. This entry was posted on May 11, 2018, in Blog and tagged 2020 suffrage centennial, Inez Milholland, suffrage history, Votes for Women. Reminder about New York Museum exhibit closing soon! SuffrageCentennials.com continues publishing. Link up with us as the 2020 national suffrage centennial approaches in 2020. Follow by email, Twitter, and Facebook. This entry was posted on May 1, 2018, in Blog and tagged 2020 suffrage centennial, New York State Museum, suffrage wagon, Votes for Women. 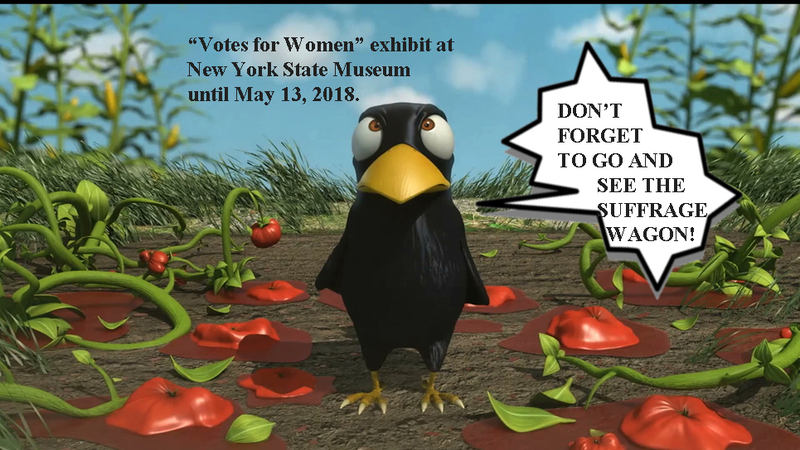 “Votes for Women” exhibit on view at New York State Museum to Mother’s Day 2018! “Spirit of 1776” wagon on exhibit at the New York State Museum in Albany, NY through May 2018! on Vimeo. 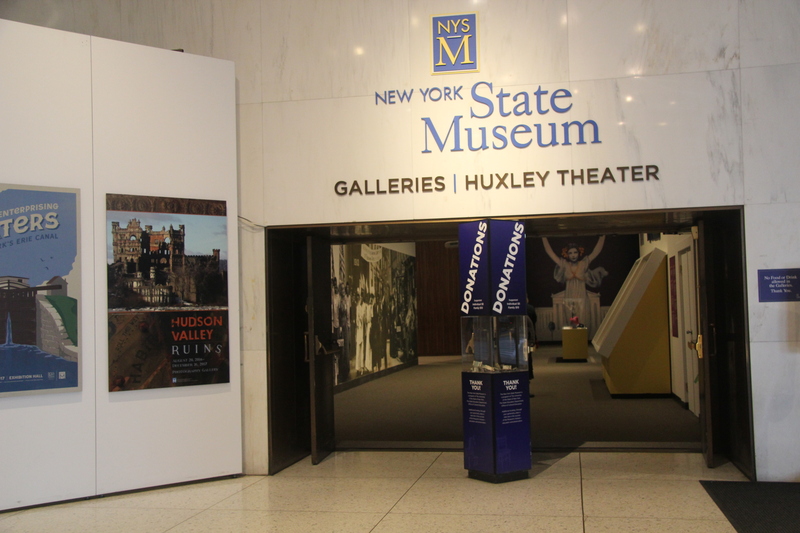 Walk through the front door of the New York State Museum in Albany, New York and the exhibit’s impact is felt immediately in the lobby when viewing the “Spirit of 1776” horse-drawn suffrage campaign wagon used by Quaker activist Edna Buckman Kearns in New York City and Long Island in 1913. Turn to the right in the direction of the museum’s West Gallery and enter a foyer where larger-than-life images of women activists bridge the past and present. These activist heroines peer at us from 1917, 1977, and 2017 with determined and persistent expressions that keep museum visitors from feeling distant from the exhibit’s content. New York State is the cradle of the women’s rights movement in the United States. Most Americans aren’t even aware of this. “Votes for Women: Celebrating New York’s Suffrage Centennial” is a large-scale exhibition at the New York State Museum with a companion catalog reflecting a collaboration between three state agencies that will keep this display on public view through May 13, 2018. New York’s men voters approved extending the ballot to women in 1917 after a difficult uphill effort by the state’s women over seven decades. “Votes for Women” is an exhibit dedicated to the cause of freedom. Several hundred people attended a suffrage history conference sponsored by the NYS Cultural Heritage Tourism Network, in addition to a reception hosted by the NYS League of Women Voters on November 3, 2017, the day before the exhibition opened to the public. Spirit may be difficult to put into words, but the collection of banners, memorabilia, symbols, tools, multi-media aids, and information panels presented a powerful, stimulating, and provocative reminder of decades of struggle for voting rights. This entry was posted on April 21, 2018, in Blog and tagged New York State Museum, suffrage centennials, Votes for Women. 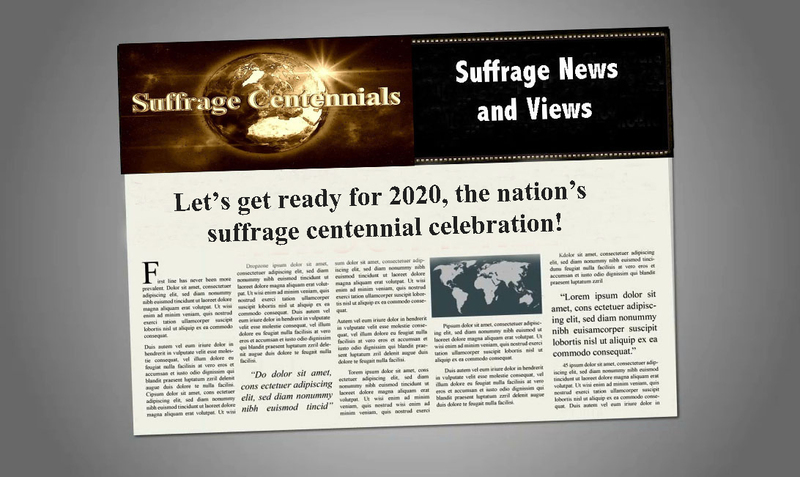 SuffrageCentennials.com is gearing up for 2020 and the national centennial of U.S. women voting. Count on us for news, views, events, and celebrations. This entry was posted on April 1, 2018, in Blog and tagged New York State Museum, Votes for Women. Saturday, November 4, 2017 was a big day for the New York State suffrage centennial in Albany, NY. The conference during the day sponsored by the NYS Cultural Heritage Tourism Network was a highlight, along with a reception during the evening hosted by the NYS League of Women Voters to coincide with the opening of the NYS “Votes for Women” exhibit at the New York State Museum. The exhibit, four years in the making, is on display through May 2018. New York State is celebrating its 2017 suffrage centennial! on Vimeo. This entry was posted on November 19, 2017, in Blog and tagged 2017 suffrage centennial, 2020 suffrage centennial, suffrage centennials, Votes for Women. Suffrage centennial events link food with women’s rights programming! Food and Activism go together: From Suffrage Wagon Cooking School on Vimeo. 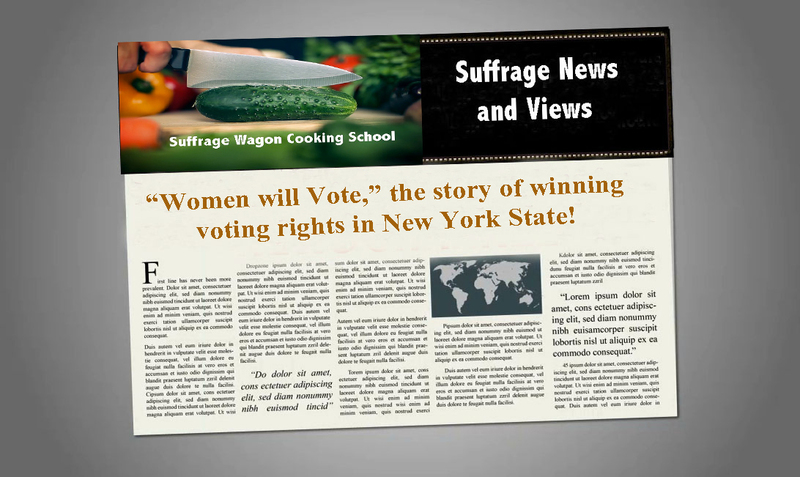 Suffrage Wagon Cooking School promotes vintage voting rights cookbooks with fundraisers, programs, and special celebrations. It’s fun. It’s authentic. And something we’re finding more often as the long struggle to win voting rights. Stop by the cooking school. Find out about demonstrations and tips. OTHER SUFFRAGE NEWS: “Beyond Suffrage: A Century of Women in New York Politics” opens October 11, 2017 at the Museum of the City of New York. Massachusetts has a suffrage centennial web site. Women will Vote is one book due to be published in September 2017 from Cornell University Press that puts the suffrage organizing to win the vote in perspective. This has been difficult because the struggle took decades and encompassed many different organizations, strategies and tactics. Hundreds of voting organizations and activists of many types worked for the same goal of voting rights for women. No one individual or organization stood for the varied tactics and goals of what many considered an impossible task of uniting American women under one banner of Votes for Women. There were tens of thousands of grassroots activists. While one organization may have made decisions to support one platform, dozens of other organizations chose other positions and strategies to reach the same goal. This entry was posted on September 3, 2017, in Blog and tagged 2017 suffrage centennial, 2020 suffrage centennial, suffrage centennials, Votes for Women. More programs about women’s rights during 2017! Patriotic protest women’s suffrage movement artifact on exhibit during 2017! from on Vimeo. 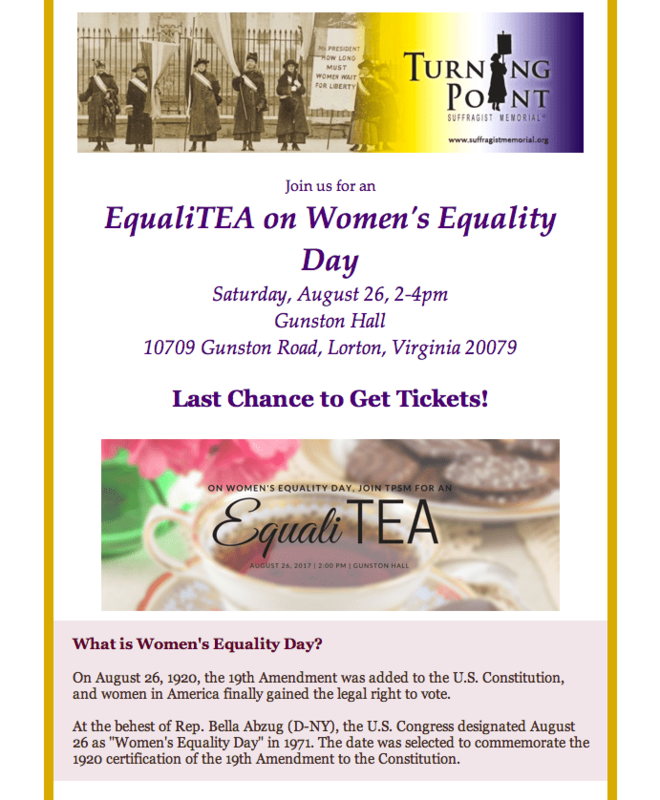 EqualiTEA on August 26, 2017, 2-4 p.m. in Lorton, VA. Turning Point Suffragist Memorial. “HEAR THEM ROAR: THE FIGHT FOR WOMEN’S RIGHTS” is a devised & environmental theatre performance directed by Nan Smithner. Program in Educational Theatre. LOCATION: Black Box Theatre. ADMISSION: $15 General, $5 Students & Seniors. For tickets, contact New York University box office. ONLINE: tickets.nyu.edu. BY PHONE: 212-998-4941. IN PERSON: 566 LaGuardia Place (at Washington Square South). 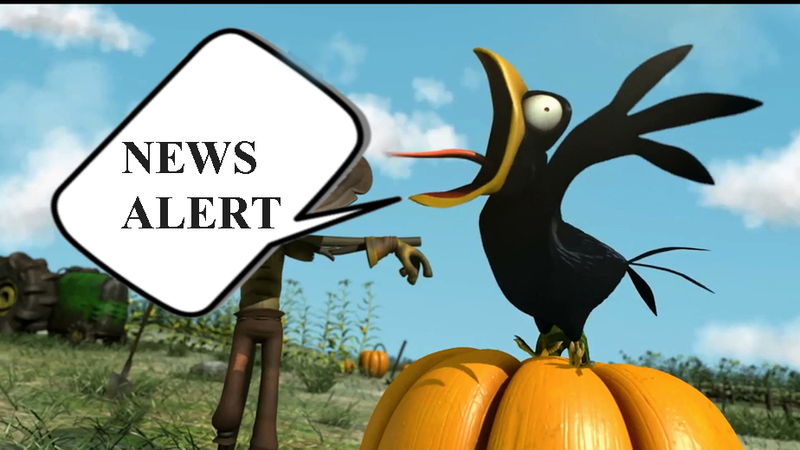 Performances: Friday, October 20 at 8 pm Saturday, October 21 at 8 pm Sunday, October 22 at 3 pm Thursday, October 26 at 8 pm Friday, October 27 at 8 pm Saturday, October 28 at 8 pm Sunday, October 29 at 3 pm. Genesee Country Village & Museum, 1410 Flint Hill Road, Mumford, will host a women’s suffrage centennial luncheon at 11 a.m. Sept. 23. Sally Roesch Wagner will present “The Rest of the Story of the Suffrage Movement,” a dialogue about the issues of equality raised by the country’s suffrage foremothers. The luncheon will feature rebel soup and salmagundi served with suffrage salad dressing, from suffragette cookbooks published from 1886-1920 to raise money for the cause. The museum will offer activities that highlight equality efforts made by women during the 19th century.Cost is $40-$45 and includes admission to the museum. To purchase tickets, visit bit.ly/2uYxItW. This entry was posted on August 23, 2017, in Blog and tagged 2017 suffrage centennial, suffrage centennial, suffrage centennials, Votes for Women.